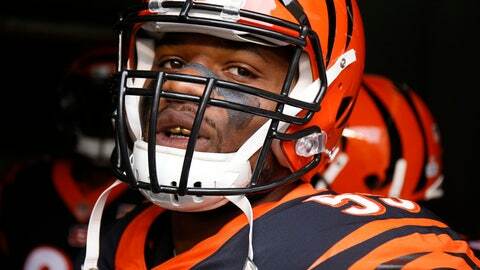 CINCINNATI (AP) — Linebacker Vontaze Burfict is back on the Cincinnati Bengals‘ active roster after serving a four-game suspension for violating the NFL’s performance-enhancer policy. He’s glad to be back, even doing some work with special teams. He watched his teammates pull out a 37-36 win at Atlanta last Sunday on Andy Dalton’s touchdown pass to A.J. Green with 7 seconds left in regulation. Burfict’s next snap will be his first of the season. He had an ankle injury that limited him during training camp, and he sat out all four preseason games before leaving the team for a month to serve his suspension. How much he’ll play is unknown, but he has a history of piling up snaps in similar circumstances. He was in for 36 plays against Pittsburgh in his first game in 2015 after missing six following knee surgery, 34 against the Dolphins in 2016 after missing three games following an NFL suspension for egregious hits, and 52 at Cleveland last season in his first game following another three-game NFL suspension for an egregious hit. The Bengals activated Burfict after Friday’s practice. They hope he can shore up a defense that ranks 29th in the 32-team NFL in yards allowed and last in opponents’ third-down conversions while giving up the 10th-most points in the league. Burfict expects his biggest contribution might be his fiery personality — the same intensity that has led in the past to penalty-causing, suspension-inducing hits. Temperatures in the mid-80s are forecast for Paul Brown Stadium, which could affect Burfict’s stamina. But he believes the conditioning he maintained during the suspension will help him stay on the field. He also doesn’t anticipate needing much time to adjust to first-year defensive coordinator Teryl Austin’s system. BERNARD RULED OUT: Running back Giovani Bernard didn’t practice on Friday and was ruled out for Sunday’s game, leaving Joe Mixon with a bigger role in his return. Mixon missed the last two games following arthroscopic surgery to remove a cartilage chip from his right knee. He returned to practice this week. Receiver John Ross also was ruled out with a groin injury. Tight end Tyler Eifert went on injured reserve with a broken right ankle suffered Sunday at Atlanta.